A nice article I found. A look at how to customise your right click menu. Who doesn’t love a shortcut? Thanks to the guy who programmed in the right click menu, we get to take some of them while working or browsing on the computer. Here at MakeUseOf we have looked at some of the ways to add more power to the right click menu. Earlier we have looked at ways to customize the right click menu on your own or use the free ‘Mmm’ to do it for you. We have also looked at ways to clean up all the rubble from the right click context menu here. But here I am back again looking at three more ways to give my right click menu a booster shot. As the name says, navigating through the folders and directories of your hard-drive with the right click becomes easier with this freeware. You can set up your frequently used folders and access them. Also, you can set up some separators to categorize the Folder Guide entries. Of course, you can set it up through manual additions in the send to folder too but ‘Folder Guide’ just does it a bit more neatly saving you some clicks. Access the ‘Folder Guide’ menu by right clicking on file, folder background, Windows Explorer, Open/Save dialog boxes, Desktop, or Start Button. Add your favorite folders, sort them in your own order, arrange them with separators and you’ll have quick access at the click of a right button. With a small imprint of just 1.6 MB, Folder Guide is worth a try. Nope, cows don’t take shortcuts. Moo0 RightClicker is just a handy set of improvements for our right click menus. The 4.2 MB free software has a free version and a more feature laden paid counterpart. The free version is a good help as it gives the right click menu some useful add-ons and also allows the user to manage the ones already there. The program opens with a notice mentioning a bug in Win XP which causes CPU utilization to spike to 100% temporarily (though, I did not catch any…) under certain usage conditions. It gives the option to turn off some ‘Effects’ in Display Properties. The functions are simple to understand. The free version gives two interface options – Simple and Basic. Copy and move files and folders to bookmarked or standard system folders. Bookmarking often used folders is a nice touch. Intelligent copying – using the name, path, or contents of an actual file. Sort folder contents by numerous attributes. Arrange neatly with quick-collapsing menus. Delete items permanently bypassing the recycle bin. Moo0 doesn’t remove any of your earlier customizations but lets you add some more. So it integrates the earlier shell entries you might have made. Un-installation is also safe. The only thing I wish is that could have given me a bit more choice against its default lime green color. The powerhouse for the last mention. FileMenu Tools goes further than the previous two mentioned. It takes the context menu out of the box and literally makes it a file manager. It allows you to either clean up the clutter or throw in a few more options for handling files and folders. Over and above, add your own choice of programs, folders and paths. Also, add your own icons and names through the properties dialog. Configure built in commands or add customized commands according to the file types you right click on. 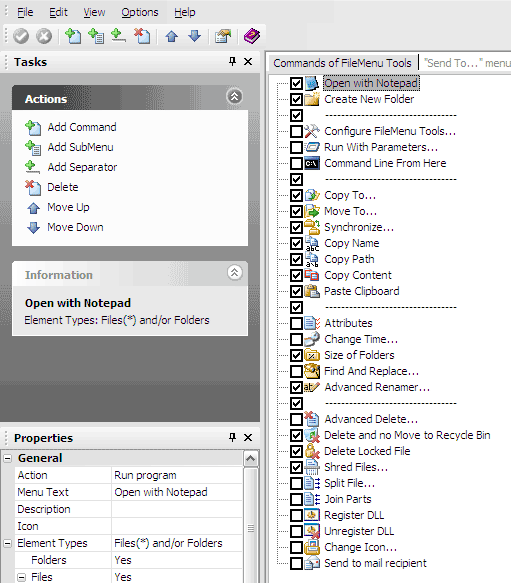 Configure the ‘Send to Menu’ within the FileMenu program. A very handy advanced renamer lets you batch rename all files in a folder. Synchronize two folders from within Windows Explorer. Split-join files and also compresses the parts. Find or replace a text for all the files that a selected folder contains. Delete only files of a specific type. For example, delete only the ‘.log’ files from the temporary folder. Securely shred your files and make them unrecoverable. Get a view of folder size through a pie chart. Send selected contents as email attachments. Add separators and demarcate your right click shortcuts. These are just some of the utilities packaged inside FileMenu Tools. The greatest advantage beyond the ease of configuration is that the software bundles a lot of disparate utilities in an accessible collection. At an installed size of 6.4 MB and a freeware it’s click worthy. The choice of decking up your right click menu depends on the kind of power you want to give it. But it’s a certainty that you will be spoilt for choice with the free software available.